Thirty percent of the world’s adults are snoring regularly. Snoring may disturb your partner but without health concerns, as in simple snoring. However, it needs to be evaluated to exclude central or obstructive sleep apnea (OSA) and upper airway resistance syndrome (UARS) – OSA and UARS are associated with blood oxygen deprivation and increased work of breathing leading to disturbed sleep and daytime sleepiness. Long term, oxygen deprivation increases the risks of heart attacks, hypertension, diabetes, stroke and memory problems by 3 to 5 times. Of women with preeclampsia blood pressure problems in pregnancy, 50% have OSA. Adults complain of daytime sleepiness, irritability, depression, impaired concentration/ memory, fatigue and morning headaches. At night, there is choking or stopping of breathing episodes, grinding of teeth, increased urination and poor libido. Non-surgical treatment to improve on obesity, allergic rhinitis and sleep habits/ position. Reduce alcohol intake. Continuous positive airway pressure mask (CPAP) is highly effective for OSA. These are increasingly portable and comfortable. A good mask fit .is key, and correct use of and maintenance of the mask and a clear nasal airway is important. 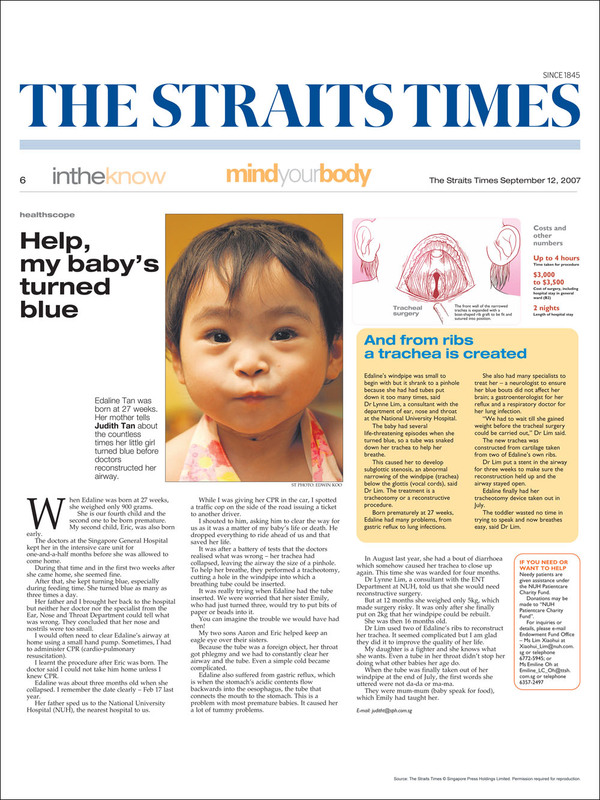 First- line surgery addresses the nose, soft palate and tonsil sites of block. In some patients, this is helpful even if CPAP masks are worn, to decrease airway resistance and discomfort during use of the mask. Third- line surgery by oral-maxillofacial specialist addresses the tongue base and advances the mandible lower jaw. Done together with dental realignment. Salivary gland lumps – These could be benign or cancerous tumors, or swelling due to acute or chronic infections or stones blocking the salivary ducts. The main glands are the parotid, submandibular and sublingual glands. Neck lymph nodes – These could be benign or cancerous nodes, and due to infections, systemic disorders and blood disorders. All nodes should be further evaluated if they are increasing in size and numbers, last more than 3 weeks, are fixed to the skin or ulcerate. Thyroid lumps – These can be benign or cancerous, a Multinodular Goitre or generalised swelling eg in Grave’s Disease. May be associated with thyroid hormone disorders. Thyroglossal cyst – This is a congenital cyst that is usually sited in the midline of the upper part of the neck, and moves with swallowing. Cancerous change is possible but rare. Branchial cyst – This is a congenital cyst that is usually sited at the upper half of the lateral neck. Ranula – This usually presents as a floor of mouth and sometimes below the chin soft cystic swelling. Due to trapping of salivary mucus. Hemangioma and Lymphangioma – These are vascular and lymphatic malformations, filled with blood or lymphatic fluid. First branchial cysts/ sinuses – These present as lumps/ openings around the ear region or angle of the jaw. The sinus tract is often complexly related to facial nerve and vessels in the head and neck. Besides presenting as a lump, head and neck tumors may present as blood stained sputum, nose bleed, hearing loss, ringing in the ear and ear block. The lumps may swell with infections and reduce in size in between episodes. Destruction of structures closely related in the head and neck region results in various problems with breathing, swallowing, eating, voice, dentition, cosmesis and bleeding. Seeking evaluation and treatment as early as possible is critical for ensuring the best outcomes for cancer cases. Ultrasound scans are useful for neck lumps to determine size, numbers, and suggest if the tumor is likely to be benign or cancerous. The voice may become raspy, harsh, of different pitch and low volume. Hoarseness lasting more than 3 weeks requires evaluation to exclude more sinister causes. Voice rest. Avoid voice overuse of wrong use. Voice training and rehabilitation by speech and swallow therapist. Stop smoking. Better control of gastroesophageal reflux (eg avoid spicy, sour and oily food and caffeine). Medications for cough, gastroesophageal reflux and allergies as appropriate. 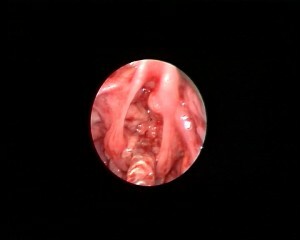 Surgery for cancer of the larynx would require further investigations for extent of involvement and spread. Endoscopic, laser or open surgery, with or without chemotherapy and radiation therapy. The problems can affect the oral, pharyngeal or esophageal phase. Due to poor dentition, neurological conditions (eg stroke, vocal cord, brain and spinal cord injury, Parkinson’s disease, sclerosis, Alzheimer’s disease) and head and neck pathologies (mouth, throat, esophagus cancers, injury and surgery). There may be coughing/ gurgling/ increased effort and time/ drooling when eating and drinking. There may be recurrent lung infections from aspiration, weight loss and dehydration. Work with gastroenterologists, swallow pathologists, physiotherapists. Observe feeding to see the patient’s posture, behavior, and oral movements during eating and drinking. Stridor is noisy breathing arising from blocked airway at the level of the voice box and trachea. When significant, there is risk of acute oxygen lack, respiratory distress leading to cardiac arrest and death. Feeding, swallowing, voice and lung function are often concurrently affected. 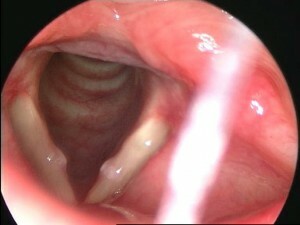 In cancers of the larynx, preservation techniques for voice and swallowing is attempted where possible.